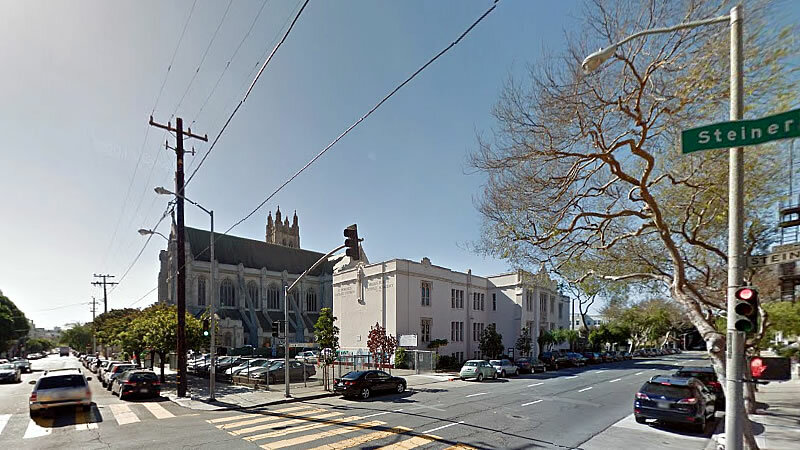 Plans to raze the St. Dominic’s Catholic School Building at the corner of Pine and Steiner, adjacent to the now flying-buttressed St. Dominic’s Church, are in the works. As proposed, a new three-story Pastoral Center with multi-meeting rooms, a childcare center and other support services for the parish would rise on the site, over a new 54-car underground garage. And if approved, a four-story Phase Two building with 107 apartments, a mix of 75 studios and 35 one-bedrooms, would then rise up to 50 feet in height at the corner of Pine and Pierce and the garage would be expanded to accommodate up to 217 cars. But the aforementioned school building, which was constructed in 1929, has been classified as a category ‘A’ historic resource. As such, the City has been encouraging the church to retain and reuse the existing building, and should that “prove to be infeasible,” it is “strongly urging” the church to explore siting the proposed Pastoral Center along Pierce rather than Pine, which would conflict with the plans for the proposed apartments. Wow. That’s an ambitious plan. Great location and use of land for lots of apartments and underground parking! The school building is an attractive supplement to this most excellent English style Gothic Revival church. I hope they find a way to preserve it. Unfortunately when the flying buttresses were added to the church, they “value engineered” them into a simplicity incongruent with the highly and beautifully Gothic main fabric. I hope they find the money now to have the proper ornamentation completed. This is an important building in the history of San Francisco architecture and deserves great care. The new buildings should also be designed in sympathy (not necessarily imitation) with the church itself. I don’t think I follow you: obviously you’re too informed to argue flying buttresses are “incongruent” w/ Gothic architecture, but what’s your specific complaint with them (?) …the original building was quite simplified (lacking in ornament) compared to Old World models. I agree re: the school – my commuter bus passes here each evening and the church and school are a welcome sight. Disagree re: the buttresses; I think they did an excellent job. I’m a parishioner here. The flying buttresses were the best option from what I understand. The alternatives were either tearing down the church or putting a bunch of internal bracing in to prevent the structure from coming down after Loma Prieta. The engineers worked with the parish to find a choice that would preserve the interior of the church over the exterior. Gothic architecture. They are brilliantly minimalist. And I do agree the new buildings should be respectful of the existing church architecture but not slavishly imitative of it. I rarely agree with your posts, but this is spot on. EHDD would have provided buttresses with appropriate ornament for a church like this, if the church had the money. There are hundreds of such examples. Plain ones were all they wanted to pay for. There is no dispute that they were needed for structural support, or they would not have been added at all. I would disagree. The new buttresses match almost IDENTICALLY in form, shape and detailing at several original buttresses surrounding the apse. Those have a small amount of carved in detailing at the very end caps where the buttress continues down to the ground and foundation. The NEW buttresses have a similar, and sympathetic “shield” end cap but not the detailed carving. I don’t know the exact story behind the buttress detailing and cost issues, but knowing the ideology of EHDD their work is typically without ornamentation and overly stylized forms, but rather honest expressions of program and function. Always hated those ugly flying buttresses on that gorgeous church. Now I know why they’re there. I am wondering if something better could be done about saving the building, today. Also I can’t imagine this parish has much $ or a lot of people going. Most churches in SF are pretty empty these days. In the UK they sell old church properties and turn them into gorgeous homes. I think that should be done here in the USA, especially SF. There’s a dwindling church population. Have you ever been to Europe to see the great Norman, and English and French Gothic cathedrals? Flying buttresses have always been an integral part of the church architecture of those periods from the 4th century on. They’re never ugly, but rather a pure, visible example of how built structure works to resist lateral forces. They are quite beautiful in that concept. Actually I have been to Europe, and I’ve seen the Churches with buttresses. Our own SF’s version is quite lacking. To what do you base your claims about Catholic churches in San Francisco?? Also, anecdotally, I’ve seen a lot less people in SF Catholic Churches when I’ve visited. Huh? This church is packed 5 services on Sunday. I wouldn’t call the 9P “packed”…at least not when compared to the others. its 80% full on morning service and 70% at 5:30 service. sorry, iim pro-development, but not in this case. 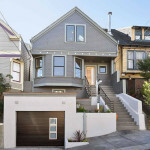 why would we want to block the view of one of the most beautiful buildings in all of SF? besides Grace Cathedral, this is the most beautiful church and a 4 story building would block the view of a landmark building. Does the church support this? And the huge existing parking lot is better? What was on this site before the parking lot? My guess, 2- to 3-story buildings. 50 feet isn’t ridiculous and there are courtyards separating the residential building and the parish hall from the church. Also, there’s currently a building that’s already “blocking” half of the back of the church which will remain. Yes, a parking lot is better than a building, at least when you’re trying to see something above ground. It’s a shame they can’t let them build parts a bit higher and eliminate the pre-school building by putting its functions on the lower floors of taller buildings elsewhere on the site. And what’s with the open garage driveway right at the corner??? And, since I’m being picky, scratch the “open to garage below” thingy. Bad idea. There was a beautiful school there called St. Rose Academy. It was one of the Flood Mansions and was turned into a Catholic girls’ school run by the Dominican nuns. The building was damaged in the ’89 earthquake and it was financially infeasible to rebuild, so was eventually demolished. Very sad loss, it was an excellent school. I think this plan seems like a good use of the space. Block the view? It would only block it from a small section, and in return would be a nice garden / plaza from which one could view the building up close (instead of seeing the church past a broad expanse of asphalt. If the public and City value preserving “the view” that much then they need to condemn the land. Better level most of pacific heights just to be sure none of the view is blocked! Plus, we get even more parking lots! Win-win! Does the church support this? St. Dominic’s is the project sponsor. Stop with the view blocking… just, stop. im generally not in favor of stopping development for views, especially from one condo to the next. I just so happen to think St Dominics is one of the most beautiful churches in US. If the church is in favor, then so am i dammit. A good deal of the now parking lot was once the home of St Rose Academy which was torn down after the 89 quake. Believe this was 3 stories. That school is architecturally significant? Hmm. Anyway, in favor of this. Good use of the parking lot. Under RFRA, does the church actually need City approvals? Or can they just claim a religious exemption? Is the church subject to affordable housing requirements for the apartment building? And will the church have to pay property tax on the apartment building, or do they get to claim a religious exemption to that too, imposing the cost of 100+ residents on the City without a corresponding increase in City revenue? 1- great example to set for the other catholic churches with seas of parking around them. 3- oof, so much underground parking! do they do double parking on the surrounding streets on sunday? there is no doubloparking on surrounding streets on Sun. They have valets in the parking lot and pack it to the brim. My guess is well over 100 cars in parking lot for Sun AM and PM mass. Double-parking is only for Protestants. There is no valet parking on Sundays.